4 CANAUX DE FORMATION SERONT A VOTRE DISPOSITION : * COURS DE CODE LE SOIR AVEC TESTS A VOLONTE . * STAGES ACCELERES MENSUELS A VOLONTE. * TESTS CODE DE LA ROUTE EN LIGNE AVEC SUIVI . * LIVRE DE CODE DE LA ROUTE ( prêté durant toute la formation )UN MONITEUR DIPLOME D'ETAT ASSURE LES COURS DE CODE ET LES CORRECTIONS DES TESTS DE CODE. LES COURS ET TESTS DE CODE ONT LIEU LES LUNDI, MARDI, MERCREDI ET JEUDI DE 17h00 a 18h00 . LES EXAMENS DE CODE SONT ORGANISES PAR 2 ORGANISMES PRIVES AGREES ( LA POSTE et SGS ) L'EXAMEN DE CODE SERA REUSSI LE CANDIDAT OBTIENT AU MINIMUM 35/40. LA DUREE DE VALIDITE DE L'EXAMEN DE CODE EST DE 5 ANS OU 5 PRESENTATIONS A L'EXAMEN DE CONDUITE SUR LA MEME PERIODE. * COURS DE CODE LE SOIR AVEC TESTS A VOLONTE . * STAGES ACCELERES MENSUELS A VOLONTE. * TESTS CODE DE LA ROUTE EN LIGNE AVEC SUIVI . UN MONITEUR DIPLOME D'ETAT ASSURE LES COURS DE CODE ET LES CORRECTIONS DES TESTS DE CODE. LES COURS ET TESTS DE CODE ONT LIEU LES LUNDI, MARDI, MERCREDI ET JEUDI DE 17h00 a 18h00. L'EXAMEN DE CODE SERA REUSSI LE CANDIDAT OBTIENT AU MINIMUM 35/40. 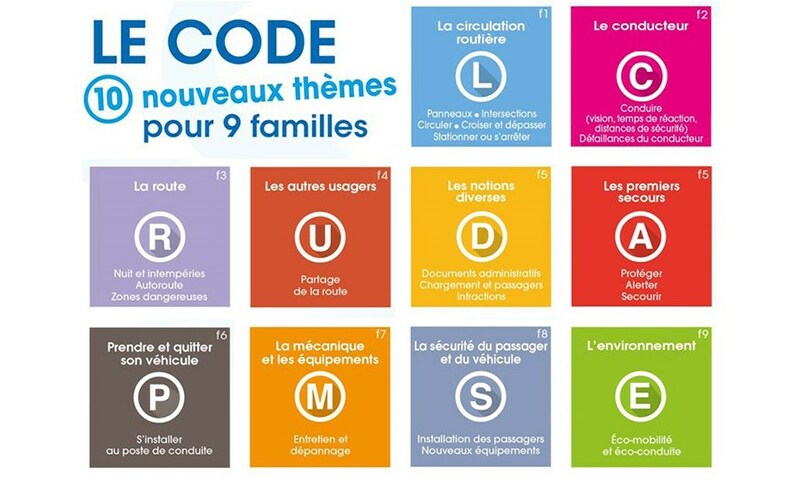 LA DUREE DE VALIDITE DE L'EXAMEN DE CODE EST DE 5 ANS OU 5 PRESENTATIONS A L'EXAMEN DE CONDUITE SUR LA MEME PERIODE.